Shares of Cheniere benefited from the energy industry's gains after the OPEC production cut announcement. It's hard, though, to see how that impacts the company. 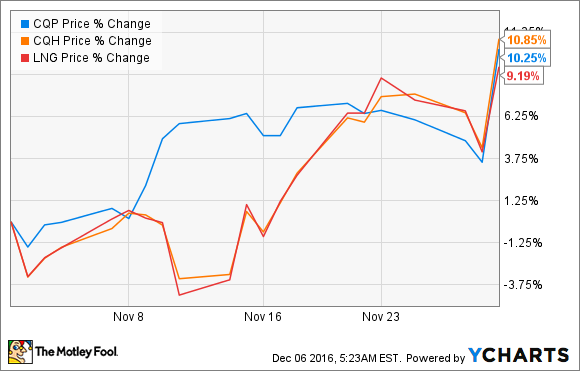 Shares of Cheniere Energy Partners (NYSEMKT:CQP) and Cheniere Energy Partners Holdings (NYSEMKT:CQH) gained more than 10% in November. The biggest news that caused the jump was the announcement that OPEC was cutting production. Shares of parent company Cheniere Energy (NYSEMKT:LNG) also saw a significant boost. Sometimes the tide lifts all boats, and that certainly seems to be the case with Cheniere Energy Partners stock this past month. The company did post rather encouraging results at the beginning of the month that showed its Sabine Pass LNG terminal was on schedule and that it was making progress on some new initiatives. Still, the thing that seemed to get everyone excited about Cheniere's stock this past month was the announcement that OPEC was curtailing production. Stepping back and surveying the landscape, it's hard to see why Cheniere will benefit from an OPEC oil cut unless you play the six-degrees of separation with the oil market. As a company that processes U.S. natural gas and exports it via LNG, there is actually little direct correlation between Cheniere Energy and oil prices. Another way that you might be able to link oil production to Cheniere is that a lot of LNG sales outside of the United States are based on prices that are indexed to the price of oil. Cheniere has the benefit of sourcing natural gas in the United States, where natural gas has its own separate trading price and is much lower than most indexed prices. As oil prices rise, so too does the price of LNG from places like Australia and the Middle East, making Cheniere's offering more attractive. So really the only thing that the boarder market can influence is that 10% or so of un-contracted LNG sales, which hardly seems enough to significantly move the company's stock. While shares of Cheniere Energy Partners will pay you for being patient -- today the stock has a distribution yield of 5.8% -- shares of Cheniere Energy do not and it is about to buy all outstanding shares of Cheniere Energy Partners Holdings in order to simplify the business. The recent change in OPEC policy doesn't really change the outlook for any of the ways to invest in Cheniere Energy, so investors shouldn't read into this too much.